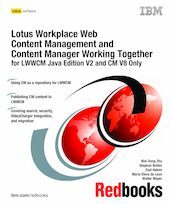 In this IBM Redbooks publication, we explore how we can put both IBM Workplace Web Content Management (Workplace Web Content Management) Java Edition V2 and IBM DB2 Content Manager (Content Manager) V8 products at work together. We provide overviews of Workplace Web Content Management and Content Manager products, discuss why we might want to integrate both products and when to do so. Before you begin integration, we cover various areas that you need to be familiar with and aware of. We provide verification checklists, hints and tips on system installation and configuration. To create an integrated Workplace Web Content Management with Content Manager solution, we show you how you can use Content Manager as the data repository for Workplace Web Content Management and how to publish existing Content Manager data to Workplace Web Content Management using federated content components, connect tags, and JSP components. With the basics of how to integrate, we address some of the issues you need to consider when planning the system architecture for the integrated solution. Other topics included in this book are portal integration, search, security, VideoCharger integration, syndication, data migration, and versioning. This book is ideal for IT architects and specialists who will be working on the integration of Workplace Web Content Management and Content Manager solution projects.